A user can now get six (6) months of free antivirus protection by becoming a fan of the McAfee page on Facebook. McAfee Security Center is a full featured security product that includes an antivirus engine, firewall, backup system, antispam, and parental controls. Check out the Review below. The installation of McAfee was kind of a pain. At first I couldn’t remember the password I setup on the Facebook account creation page. I was warned that I only had 2 sign-ins left, which was annoying. I just want to say that the licensing mechanism is a little overboard in this software. Anyways, after the license was verified the program was downloaded. The download was approximately 66 megabytes and on the smaller side compared to other free antivirus. Once the full installation started to commence, it was extremely slow. The installation was by far the slowest of any antivirus program and even puts Forticlient’s installation time to shame. The program then needs to optimize the installation which takes another 3 minutes. The McAfee is plain and outdated. Other than the graphics on the main page which consist of an X or a check mark there are only grey and white menus. If you want to customize a feature it will take about 15 seconds to actually get to the settings area. This is because a status bar will display that the program “loading.” It is beyond me why a program installed on the local computer needs that much time to prepare the settings. In addition, just switching between menus has a slight lag of about 2 to 3 seconds. I think this is totally unacceptable performance for a Core 2 Duo computer with 4 gigabytes of ram (very few active processes). Does this mean you need a Core i7 and 8 GB of ram to properly run McAfee with no hang ups? In addition I didn’t feel like there were a lot of customizable options available. 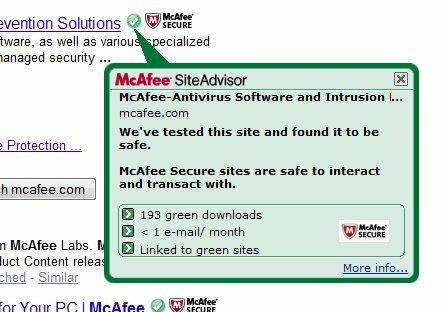 McAfee does have helpful pop-up’s which are not frequent and only display important information such as a result of a scan etc. Regardless of the interface complaints McAfee has a fair amount of features. Antivirus and Antispyware Protection. McAfee provides excellent antivirus and antispyware detection because it is able to leverage its huge user and corporate base to detect and neutralize viruses quickly. I like how the real time shield also includes automatic network drive scanning too. System Guards. McAfee provides a system guard protection often found in many paid antivirus or antispyware programs. The system guard monitors Active X, new protocol installations, winlogin shell (good so a virus can’t fake a login screen etc,) AppInit Dll’s, BHO (browser helper objects), start up items and a whole slew of other protections. While I see Internet Explorer protection, Firefox protection seems to be absent. This is a problem because there a lot of spyware toolbars (BHO’s) that are now infecting Firefox as rouge add ons. McAfee Site Advisor. The site advisor toolbar is one of the original anti-phishing detection systems. I remember that I used Site Advisor in Firefox 1.0+ when Firefox didn’t have built-in phishing and malware website checking. Therefore, Site Advisor also has to have some of the most comprehensive malware website databases. If both Firefox and McAfee are used in conjunction (dual phishing protection), I find a user hard pressed to actual stumble upon a malware site. Active Protections and HackerWatch. Hackerwatch.org is a website that MacAfee runs which tracks virus and hacker attacks from around the globe (has been around for years.) 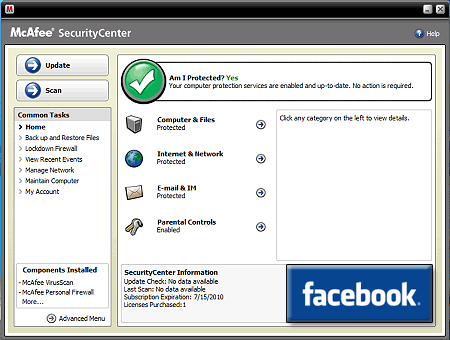 The information can be utilized by McAfee security center through the Active Protection feature. This feature essentially protects against zero day and undiscovered viruses. Active Protection also utilizes other McAfee users’ suspicious files to prevent viruses even before there are official virus definitions released. Firewall. The firewall did an excellent job at auto detecting all of the trusted programs that are used on a regular basis. Gone are the days of having to allow every program and the user deciding which programs should be allowed access and which one’s shouldn’t. The firewall settings can also be tweaked further in the respective menus. There is also a nice traffic monitor that displays active computer traffic activity. However, you can’t drill down to a specific programs traffic access. Antispam protection. MacAfee includes an advanced antispam functionality. The anti spam capability clearly is more advanced than any other free antivirus or internet security program that I have personally tested. The sensitivity of the antispam engine can be tweaked and certain languages filtering can be added. The antispam system also connects to McAfee systems to actively check emerging spam threats according to other users’ decisions. Backup. A user needs to install the .net framework before they can even use the backup functionality. Why isn't the framework included in the installer? Since MacAfee Security Center includes a myriad of modules a high memory usage profile is pretty much expected. However, MacAfee’s memory usage is still bordering on ridiculous and eclipse all of its antivirus competitors combined during idle operation. The on access scanner uses 46 megabytes (mb), the MacAfee shell uses 45 mb, the network agent uses 3.6 mb, the MacAfee proxy service uses 3.7 mb, antispam server 2.1 mb, integrated security platform 2.1 mb, MacAfee host 2 mb, and finally MacAfee services 2 mb. The total idle memory usage is about a 107 mb. Now, if a user starts a scan you’re looking at an additional 120 megabytes (227 megabytes total) in memory usage and 70 to 100% CPU usage. How can a user even with a standard 512 megabytes of ram expect to run this antivirus program? One can also start to see how taxing Security Center is on one’s system. MacAfee has really moved in the opposite direction than the rest of the antivirus industry; an evolution from heavier to lighter weight programs. I first ran a quick scan. The Quick was slow taking about 10 minutes and gets held up on scanning svchost.exe. The full scan took about 2 hours to complete which is significantly slower than competitors. There also is an option to run the scan in the background. This seems to lower CPU usage to below 50% but still I saw the CPU usage reaching 100% a few times. However, the system still seemed surprisingly responsive during a scan and more so than Comodo etc. I streamed music during the virus scan and I didn’t see any significant slowdowns. MacAfee detected all of the viruses on my virus hard drive. The scan detected 1 virus on my O/S hardrive. The file was an Infran View plugin pack and it claimed it had a Trojan based upon heuristic protection called New Malware.bm. No other antivirus program detected this threat. MacAfee has a slow interface and high resource usage but has excellent virus detection. Security Center also has a lot of important features. This version of MacAfee seems like it will work comfortable on computer with more than 1 GB of ram. I am also interested if any users can state the memory usage on their own system according to system ram size. MacAfee may have adaptive resource usage but I am tending to doubt it. Prove me wrong in the comments section. Anyways, MacAfee Security Center is available for free through Facebook. Simply login into Facebook or create an account. Search for “MacAfee” and then go to the MacAfee fan page. Click on “Protect your PC” and Select your country. You can also try these two links directly for the download.